Exposing a Zionist Hoax: How Elan Journo's "What Justice Demands"
In his book “What Justice Demands: America and the Israeli-Palestinian Conflict”, Elan Journo purports to offer a fresh approach to the subject, but its pages are filled with all the same tired Zionist propaganda that has always been used to justify Israel’s crimes against the Palestinians. The zionist propagandists extraordinary defamations are spun out so as to completely obscure; twist and contort the historical reality. Its very important we have sources like this available to take them on at every opportunity. One can argue about many details that perhaps have not been covered fully or very well as these should have been in both Elan’s Journo’s book and Hammond’s subsequent reply. However, what is irrefutable is the fact that a great injustice has been done to the Palestinian Arabs over 70 odd years, the majority of whom still they live in refugee camps. I applaud Jeremy Hammond who, over a number of years, has consistently exposed many myths regarding the origin of the Palestinian/Israeli conflict by not only arguing for acceptance that a great injustice has been done to the Arabs who were forcibly expelled from their homes but also exposing the role and duplicity of many leading nations. It is a travesty of the truth to called Jeremy Hammond’s latest attempt to put right many misconceptions a propaganda book. It should be read by all those who wish to untangle myth from reality in this long standing conflict. I have heard several times from Israel fans that those who support the Palestinian cause should take a look into the facts, but never have I met any Israel fan who has actually meant that. 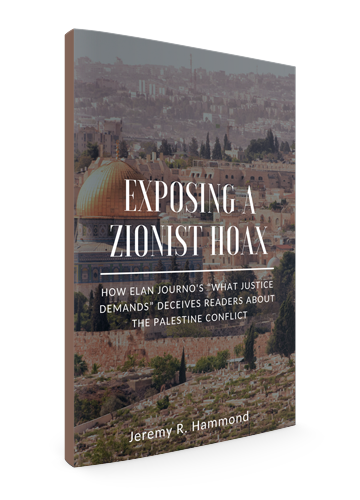 For everyone who genuinely wants to understand and educate themselves on the history and situation of Palestine, I recommend Jeremy R. Hammond’s book Exposing a Zionist Hoax: How Elan Journo’s “What Justice Demands” Deceives Readers About the Palestine Conflict (Worldview Publications 2018). 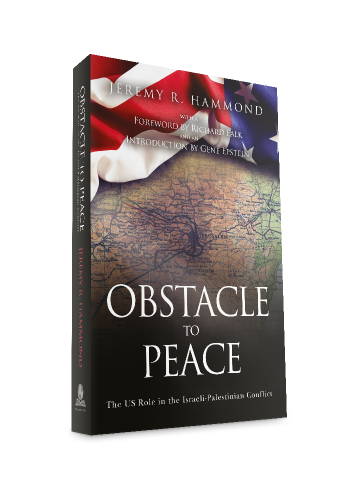 It is a response to Elan Journo’s book that claims to offer a ‘fresh’ and ‘original’ take on the Palestine conflict, but, as Hammond shows, only manages to offer a pile of old and overused Zionist falsehoods, omissions, and distortions. I warmly recommend Hammond’s book even for those who have not read, and are not planning to read, Journo’s book. From Exposing a Zionist Hoax, you will find lots of information on the history of Palestine, the establishment of Israel, the ethnic cleansing, occupation, censorship, the economy of Palestine, the ‘peace process’, and so on. Hammond argues convincingly for his moral stand and offers lots of credible sources for his readers to back up his claims. After reading all of this, I wonder does Journo genuinely believe in what he says in his own book. 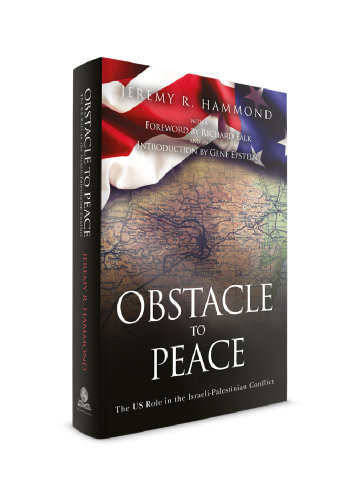 Even though Hammond has written his book as a response to another, it is written so that it can have value even years after everyone has forgotten that Elan Journo ever existed: Its responsive nature just guarantees that Hammond is not fighting against his own straw men, but he is engaging in a dialogue with authentic and significant Zionist views, claims, and arguments. 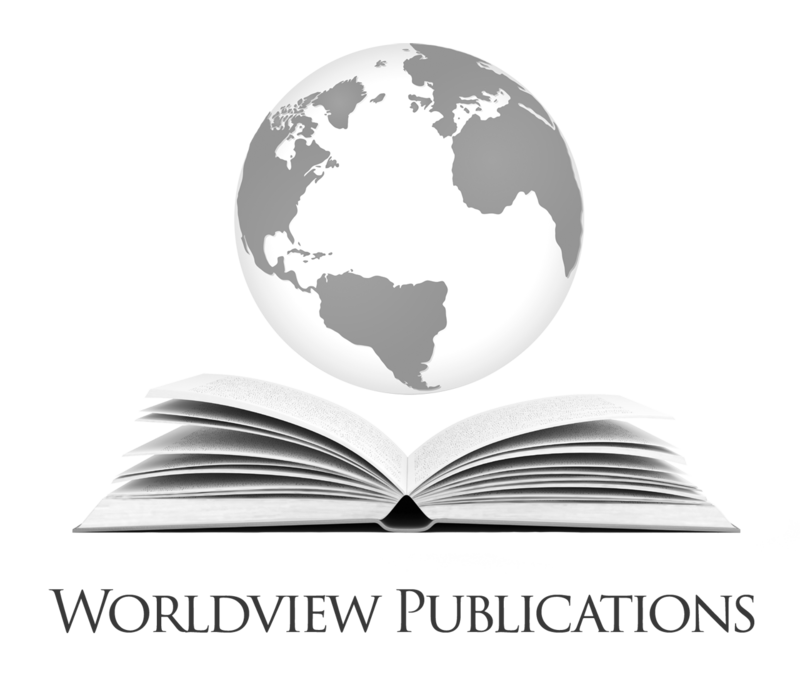 His thorough investigation and evaluation of this wide range of claims and wide use of sources, in a quite small number of pages, make Exposing a Zionist Hoax a useful handbook for anyone who wants to take a look into the facts. The author is a specialist bringing a load of quotes to demolish yet another lying zionist. Personally i have no tolerance for the type of book Mr. Hammond is commenting on ; i have seen so many proof of the sickness of those people that for my health i tend to stay away. I don’t like propaganda, especially when it’s disguised as objective opinion. But when an author is identified as “unapologetically pro-Israel”, he clearly does not intend to address the way in which Israel was established on another people’s land, and does not intend to address the methods it maintains its control over that land and its people. For that reason alone, Exposing A Zionist Hoax, Jeremy R Hammond’s forensic deconstruction of Elan Journo’s book What Justice Demands: America and the Israeli-Palestinian Conflict, is essential reading for anyone who really wants to know where Israel came from and what its plans for the region are. Point by point, Hammond demolishes the dubious claims made by Journo. Along the way, Hammond addresses the facts in relation to Israel’s ethnic cleansing and the legitimacy of Palestinian grievances. He has exposed Journo’s book for what it really is – unapologetically pro-Israel propaganda. JEREMY HAMMOND’S BOOK CAN BE RECOMMENDED to anyone who wishes to avoid the traps laid for the uneducated in What Justice Demands: America and the Israeli-Palestinian Conflict, by Elan Journo. Those people who have no patience for convoluted Zionist rationalizations, nonsense and lies should avoid Elan Journo and save their time and money. Exposing a Zionist Hoax reveals most of the standard arguments Zionists have used since 1948 to reverse history, to invert morality, to justify mass-murder, to steal a country, and to bamboozle Americans to create the most profitable criminal enterprise in the history of Man. If that weren’t bad enough, Zionism is also implicated in both world wars and in every war since. In the late 1950’s when I was about 9 years old I recall seeing a news report on tv in Canada about the state of affairs in Palestine and the Israel issue. At the time I thought it seemed entirely unjust and incapable of continuing. I never imagined things would persist and become a complete travesty of justice supported by much of the western world and particularly their government leaders and representatives along with wholesale mainstream media disinformation. It has become appalling in the last couple of decades the deceit which is reported as if no history or truth exists for the original inhabitants of Palestine, many which were of Jewish descent. Your book is a refreshing relief filled with historical context, fact-based references and exposure to our current and previously nonsensical fact-free stories commonly accepted by the unsuspecting general public with little interest or time to research the evidence or personal connection with the true historical Palestinian community. Thank you for your enlightening effort at freeing the public from this terrible deluge of fiction which demonizes the historical indigenous population who lived together in peace and prosperity sharing resources equitably for centuries. Our future depends on us freeing ourselves from these fallacies.